Globe showing planet Earth without all its water. XG - Earth Bathymetry is a WebGL globe showing planet Earth after someone has pulled out the plug and drained the world of all its water. The globe uses data from NASA's Blue Marble to provide a view of the undersea land surface and water depth. The shading of the sea floor indicates changes in slope or depth. If the blue coloring of the oceans' floors confuses you then you can click your keyboard's 'w' key to change the color to a more earth like brown color range. The 3d globe includes keys to zoom in and to rotate the map. You can also rotate the globe simply by clicking on it and dragging the map around. 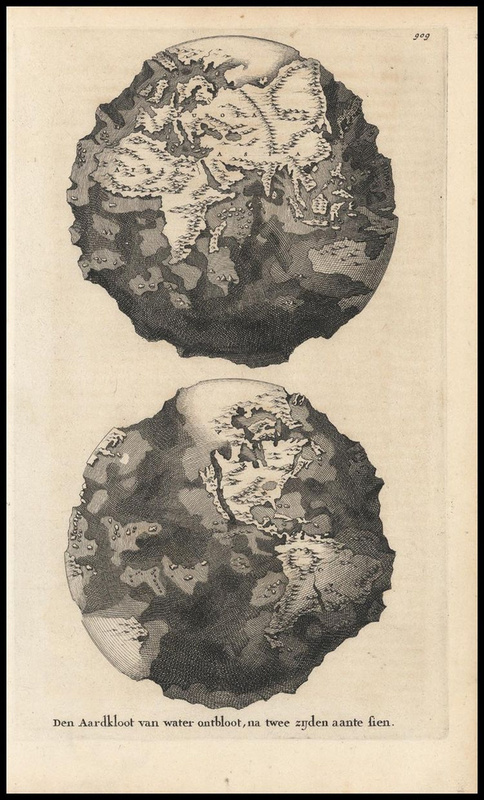 Dutch map from 1690 of what the earth might look like without water.